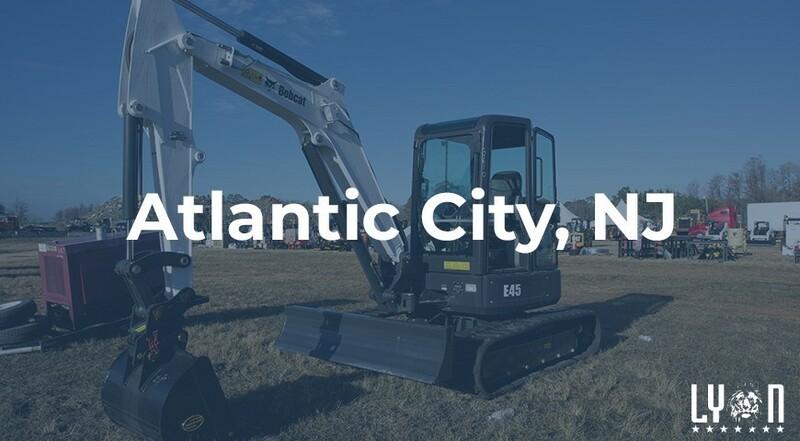 Lyon Auction will be hosting a live auction of large construction equipment just West of Atlantic City, New Jersey on Thursday, April 5th, 2017! The auction will be located at 4501 Leipzig Ave., Mays Landing, New Jersey 08330. As always, this sale will include all of the finest equipment and trucks found in the northeast! If you are looking to add some large construction equipment to your fleet, this is the auction for you! We will be auctioning a variety of equipment from brands such as John Deere, Doosan, Kubota, Bobcat, and more! You can expect to see everything from dump trucks to cement mixers, office trailers to walking floor trailers. For a comprehensive list of what will be included in this auction, click here. Mays Landing, New Jersey is a short 16 miles west of Atlantic City, New Jersey. If you are looking for a nearby hotel, check out The Inn at Sugar Hill, Homewood Suites by Hilton Atlantic City, or the Days Inn Hotel Egg Harbor Township. Currently, the forecasted temperatures will be in the mid-40s and partly cloudy. If you are looking to spend some time in Mays Landing after the auction, there is a great variety of restaurants to explore. The Ye Olde Mill Street Pub offers up great burgers, excellent prime rib, and an amazing beer selection. It’s definitely worth checking out. If Atlantic City is your desired destination, you can hit up one of the many casinos or famous landmarks. Atlantic City was home to the first boardwalk in the United States, which was constructed in 1870. The structure was originally 8 feet wide and 1 mile long and had to be taken down each winter. If this is your first time buying large construction equipment at auction, we have a few helpful tips for you! We want you to get the most out of your purchase! Purchasing a more popular brand of equipment makes for an easier time purchasing replacement parts, if necessary. Identify the year the equipment was manufactured. Factory warranties might still be in place if the machine is relatively new. This can save you big money in the long run! Listen to the engine of the machine you’re looking to bid on. If you hear strange noises or notice any fluid leaking, these could be red flags. Pay special attention to the service life of the auction item. Ask if the equipment was used regularly or if it ever sat idle for a long period of time. ever be afraid to ask to see the machine used in action. We look forward to seeing you on Thursday, April 5th, just west of Atlantic City!